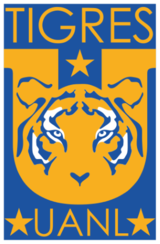 Tigres UANL has not submitted any formation. Once Caldas has not submitted any formation. Jonny Arrouyo passes the ball towards the centre... but the opponent catches it. Header by Gonzalez Ocanas... that was close. Mateo Campagnaro passes the ball... and the ball is out. Javier Luna has the ball and sees his opponent in front of him... but he can win the tackling. Fabio Pineda runs towards Javier Luna... and looses the ball. Fabio Pineda passes the ball towards the centre... but the opponent catches it. Romero Lanza tries to pass the ball to the strikers... but misses! Header by Rogelio Rodrigues... that was close. Rogelio Rodrigues steals his opponent's ball in a tackling. Andrea Pimentel tries to pass the ball to the strikers... but misses! Jonny Arrouyo has the chance to shoot... and cannot even target the goal. Jeronimo Gonzales tries to pass the ball to the strikers... but misses! Rogelio Rodrigues in a tackling... and wins it! Fabio Alvarez passes the ball towards the centre... but the opponent catches it. Cross by Jonny Arrouyo... into the clouds! Javier Luna shoots... but missed. Jeronimo Gonzales passes the ball towards the centre... but the opponent catches it. Jeronimo Gonzales shoots... but the goalkeeper dives to get the ball. GOAL - what a trick by Santiago Guerra! Jonny Arrouyo passes the ball... and the ball is out. Oscar Lanza in a tackling... and wins it! Miguel Quesada shoots... but the goalkeeper can turn the ball around the goalpost. Jonny Arrouyo runs towards Valentin Meza... and looses the ball. Valentin Meza has the ball and sees his opponent in front of him... and looses the tackling. Cross by Jeronimo Gonzales... into the clouds! Jonny Arrouyo tries to pass the ball to the strikers... but misses! Santino Rojo tries to pass the ball to the strikers... but misses! Santino Rojo in a tackling... and wins it! Jonny Arrouyo shoots... but the goalkeeper can turn the ball around the goalpost. Jonny Ospina steals his opponent's ball in a tackling. Rogelio Rodrigues has the ball and sees his opponent in front of him... and looses the tackling. Lionel Guillermo passes the ball... and the ball is out. Santiago Guerra shoots towards the goal... but into the arms of the goalkeeper! Fabio Alvarez in a tackling... and looses it! Rogelio Rodrigues passes the ball... and the ball is out. Tooor fur Once Caldas! Jonny Arrouyo legt auf Santino Rojo ab, der nur noch einschieben muss. Santino Rojo has the ball and sees his opponent in front of him... but he can win the tackling. Jonny Arrouyo has the ball and sees his opponent in front of him... but he can win the tackling. Cross by Santino Rojo... into the clouds! Romero Lanza shoots... but the goalkeeper can somehow catch it. Miguel Quesada passes the ball towards the centre... but the opponent catches it. Jeronimo Gonzales in a tackling... and looses it! Jonny Ospina shoots towards the goal... but into the arms of the goalkeeper! Fabio Alvarez passes the ball... and the ball is out.